The goal of the strategy is to protect privacy, fight identity theft and fraud, drive economic growth by driving business online and create a platform for new Web services, said a White House administration official. User names and passwords are no longer good enough and potentially pose a national security risk. In order to secure online identities, something more is needed–be it a smart card, USB token, mobile device or something else. The government would work on setting standards and facilitating the process while the private sector takes the lead in deploying the credentials and systems used to read them. “Our goal is to have a credential that would work anywhere online. If consumers want to have more than one they can,” said a White House official. In the past the private sector has been hesitant to offer solutions to the public around securing identities, but the strategy aims to change that, the administration official said. There have been concerns around liability for companies involved in identity, but the strategy intends to clarify these issues. There are no plans, however, to draft legislation around the strategy, Grant adds. Titus has been following the strategy since it was first announced more than a year ago. Originally he had concerns regarding privacy, but the document soothed some of those concerns. Still policy is going to have to be developed around privacy concerns with the strategy, Titus says. For example, a 13-year-old wanting to logon to a site needs to authenticate his age. This is done now by providing a date of birth, which is too much private information. In an NSTIC world he would provide his credential and the identity provider would verify that he met the age requirement to access to the site. Not having to give up the additional information, such as date of birth, is privacy enhancing, but what has yet to be determined is what the identity provider can do with the information in its control. There needs to be policies put in place to make sure that the ID providers can’t sell that information to third parties, Titus says. “While my retail privacy might be enhanced my wholesale privacy might disappear,” he adds. Consumers and privacy advocates need to have a voice as the policies and technologies that will make up the strategy are unveiled, Titus says. The identity providers will have a lot of consumer information and what happens with it needs to be regulated. “We should be prepared to regulate these businesses the same we do with credit reporting agencies,” he says. Titus is also watching how NIST’s role in facilitating the strategy will develop. The organization has a great reputation when it comes to creating standards while keeping out of the political discourse. This may have to change as many of the larger companies with possible roles in the identity ecosystem get ready to contribute. “They have the right team but when things start getting contentious and the bullet start flying I worry that NIST will retreat back to its comfort zone and leave the policy creation to those with the most fire power, the Google’s and Facebook’s,” Titus adds. 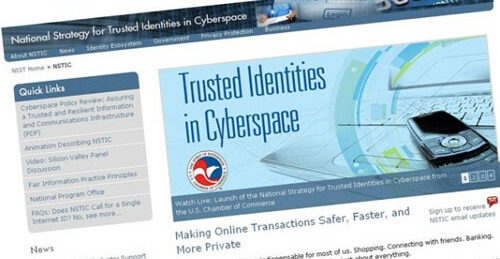 The National Strategy for Trusted Identities in Cyberspace was released on April 15 with comments from U.S. Commerce Sec. Gary Locke, Howard Schmidt, White House Cybersecurity Coordinator, and U.S. Senator Barbara Mikulski, as well as a panel discussion with private sector, consumer advocate, and government ID management experts. Is it a national ID? While NIST, other government officials, academics and private sector executives have said that the national strategy is optional and not a national ID program, some are not convinced. Jim Harper, director of information policy studies at the Cato Institute, says the government’s role in the strategy is too large. In his book Harper says the private sector should be left to come up with an online identity scheme if one is needed. Even though the national strategy calls for the private sector to implement the program, Harper is still critical. Harper warns that while a lot of time and money will be absorbed by the national strategy it’s more likely that the right identity solution will come from somewhere else. “The exciting things that may come in the identity debate will come from small entrepreneurs,” he adds. NIST’s Grant knows there are concerns that NSTIC is a national ID, but he says they are unfounded. He points out that the route the U.S. is taking is the opposite of what other countries have done where a specific technology was mandated. “The role the government does play with NSTIC is to facilitate and work with the private sector to come up with best practices,” Grant says. SAFE-BioPharma was created to try and transition the health care world to an electronic environment. The organization, created by the biopharmaceutical industry, is using and issuing credentials to help ease what can be paper-intensive research projects. SAFE-BioPharma has been cross-certified with the U.S. Federal PKI Policy Authority. Researchers with the organization’s credentials can send signed documents to government officials. SAFE BIO-Pharma can certify for level three, a high level, of identity assurance. SAFE-BioPharma conducted a 2010 pilot study that involved government and industry cancer researchers indicates that using interoperable digital identities, digital signatures and cloud computing to accelerate initiation of a clinical trial while lowering its costs. The ongoing study involves researchers at the National Cancer Institute’s Cancer Therapy Evaluation Program, a sponsor of cancer treatment clinical trials, and the pharmaceutical company Bristol-Myers Squibb. The National Cancer Institute’s researchers used PIV credentials issued by the government while industry participants were issued credentials through SAFE-BioPharma. In the pilot, electronic documents were placed in the cloud, where the researchers were able to access and sign them immediately. The digital signatures cryptographically guarantee the integrity of documents to which they are affixed. Prior to the study, the signature process was delayed by use of courier service, fax or travel. The second phase started early 2011 and expanded the study to include researchers in pharma company sanofi-aventis. The third phase is starting this summer and will include researchers at universities and academic cancer research centers. The new digital identities will be part of the Research Education Bridge Certification Authority, an identity trust hub serving the country’s higher education sector, which currently is in the process of cross-certifying with other trusted cyber-communities. The pilot has successfully demonstrated the ease with which interoperable digital identities could be deployed and used to access electronic documents and apply digital signatures. It successfully eliminated the use of paper copies and allowed signed documents to be exchanged rapidly and securely online.